Cardinal Wings is a Cirrus Standardized Training Center. As such, the training you will receive here is identical to the training you can receive at the Cirrus Design factory in Duluth Minnesota. The course of training is a scenario based, FAA accepted FITS course designed by the University of North Dakota and is recognized by all insurance underwriters. 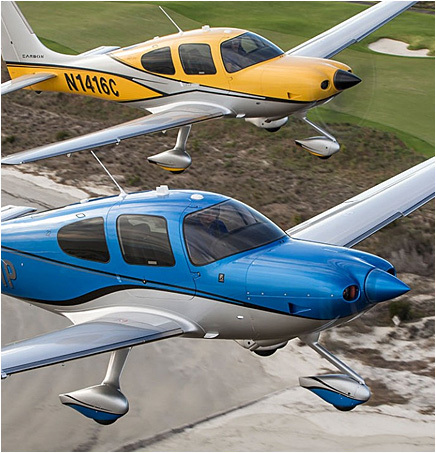 This lesson is an introduction to Scenario Based Training (SBT) and Cirrus Transition Training. This ground lesson is to ensure that the Pilot in Training (PT) has an understanding of the POH and the contents within, at a level in which the scenario-based training can be conducted efficiently, effectively and safely. This lesson will include analysis of decision making processes, Aeronautical Decision Making (ADM) concepts and risk factors in relation to an accident scenario. This lesson will include an overview of the FAA Industry Training Standards (FITS) and the concepts of a FITS accepted course. The pilot in training (PT) will be introduced to the advanced cockpit of a Cirrus aircraft and practice normal checklist use, avionics symbology and functionality, and CAPS training. This lesson provides an introduction to normal operations and automation using an aircraft or flight training device. Conducted on a planned cross-country scenario, this lesson will include normal operations of critical equipment for flight in VFR and IFR flight. The PT will generate acceptable solutions and alternatives to normal procedures and ADM while performing automation management during a cross-country scenario. The PT will implement normal procedures, including checklists, enroute procedures and arrival procedures. The PT will make extensive use of the autopilot to gain proficiency in operating various avionics in the aircraft. This lesson is an introduction to operational characteristics and normal operations. This lesson is conducted on a planned cross-country scenario to provide practice of normal procedures in a technically advanced aircraft and enhanced aeronautical decision making, information management, risk management and single-pilot resource management skills. This lesson is a ground lesson on Aeronautical Decision Making (ADM) through use of scenarios. This lesson includes numerous risk management tools and techniques to reduce the overall risks associated with flying. This lesson includes the use of Power PointTM presentation material and other media to introduce and explore scenarios, based upon the certification and ratings of the PT. This lesson provides an introduction to abnormal and emergency operations and automation competence using an aircraft or flight training device. Conducted on a planned VFR or IFR cross country scenario, the PT will generate acceptable solutions, while properly utilizing the automation and avionics available. The PT will demonstrate extensive use of the automation to develop his/her skills relating to workload management and single pilot resource management (SRM) skills.